In patriarchal society where women’s equality is not forthcoming, women are stigmatised on a daily basis for deviating from socially constructed gender norms when they resist or fail in their roles as mothers, daughters and partners. Furthermore, it is noted that stigma occurs when a person does not conform to desired socially constructed roles. When women are seen as offenders, not only have many of them resisted gender norms but they have also violated moral and legal norms. Ideas around identity change (particularly surrounding women’s relational identities) are also explored in this chapter. Criminalised women are often constructed as falling within the offender/victim/survivor trichotomy. This chapter will contend that this is problematic. 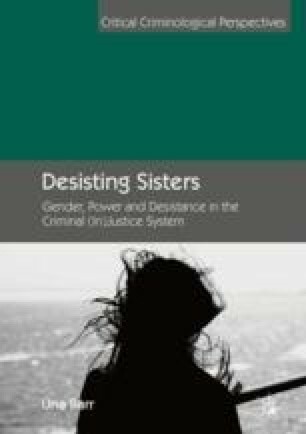 When women self-identify as offenders or ex-offenders, this can result in either a self-fulfilling prophecy or a positive move towards desistance, depending on the availability of alternative meaning structures. When women are socially identified as offenders, the result tends to be the former. Yet when women are constructed solely as victims, their agency disappears.